Custom Crystals Jewelry Handmade for Bridal Bridesmaid Flower Girl Wedding Jewelry. 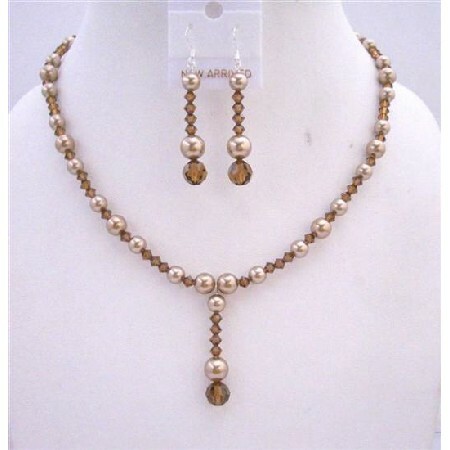 These pretty Swarovski Bronze Pearls Smoked Topaz Crystals with cute drop down. Our Wedding Jewelry accessory appropriate for brides members of the bridal party & guests. Handmade Exquisite Necklace All A Grade & Swarovski Crystals & Pearls Material are used to make this beautiful Necklace & Earrings. Material Used : Swarovski Bronze Pearls 4mm 6mm & 8mm Smoked Topaz 4mm bicone Crystals & 8mm smoked topaz round bead.